The recent explosion of web enabled mobile devices has increased the importance of comprehensive RSS Feeds for all of your products available for online purchase. Web enabled mobile devices now allow shoppers to check product pricing from anywhere, including inside brick and mortar locations. Mobile devices such as the IPhone, MyTouch, and other android enabled devices offer the additional functionality of bar code scanning. By simply taking a photo of a product’s bar code, a shopper can compare product prices and availability online. The newly empowered mobile shopper increases the importance of including comprehensive product and pricing information online, through web sites and RSS Feeds. The more data you provide, the more likely your products will rank highly when a shopper searches for alternative sources for a particular product. This can be most effectively accomplished through in depth search engine optimization, and by syndicating your product data via RSS Feeds. I have long been a proponent of the Free To Paid model of software subscription sales. For those unfamiliar with this model, you offer a free product coupled with value added upgrades available for a reasonable fee (usually charged either monthly or yearly). The Free To Paid models offers the best of both worlds when it comes to customer acquisition, retention, and monetization. Users are offered a reasonable set of features for free, and are gently but persistently encouraged to upgrade their memberships to receive even more value. Paid members who wish to cancel their memberships can usually be encouraged to maintain the free membership, which maintains your active user count (critical to investment valuation) and offers you the opportunity to re-upsell them to a paid membership. Developing a successful Free To Paid subscription program takes planning. You want to give away enough to make your service enticing, but not so much that you lose the value of upgrading the membership. Once you’ve given away a feature, it is extremely difficult to charge for it without creating consumer animosity. 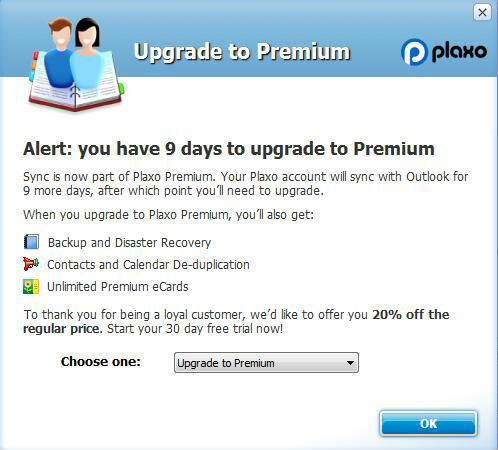 Plaxo recently encountered this when they removed their data sync feature from their free membership program, and made it available only to those who have upgraded to the Paid Premium membership. To be fair, they did give some notice to the users, in this case 9 days. And they offered a 20% loyalty discount to those who upgraded to the premium membership. But even a few days notice can leave a bad taste in the mouths of consumers who have grown accustomed to using a feature or set of features for free. Modifying the product / feature offerings for various levels of membership (free or otherwise) is a process that all subscription software companies face at one time or another. How you manage this process can mean the difference between success and failure in the court of public opinion. Aside from not offering these features for free in the first place, there are many things Plaxo should have done differently in this situation. Rather than removing these features from the free membership, Plaxo should have looked to add more value-added features that would make the paid Premium membership more appealing. For instance, the ability to schedule syncs times. 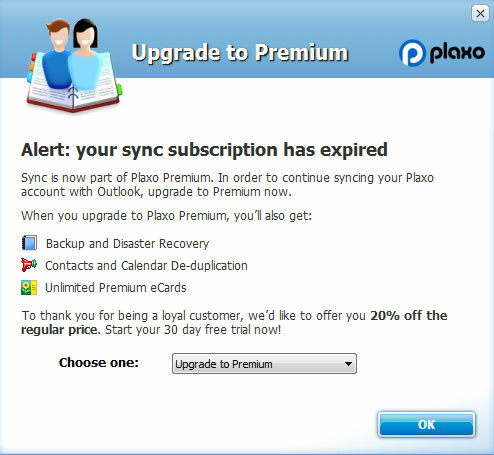 Instead of removing the Sync feature all together, Plaxo should have opted for a one-a-month sync option for free members. Or perhaps only allow 100 contacts to sync at any one time. Alternatively, Plaxo could offer free members sync options only at specific times of the day. Not an ideal solution, but certainly better than removing the functionality entirely. Ad based software is very common, and accepted, for free memberships. Providing an ad with a call to action (Would you like to learn more about this offer? [YES] [NO] ). You can always add more functionality to a membership, but removing it is extremely difficult without risking a “bait and switch” syndrome from your loyal userbase. Proper planning is essential when developing any subscription based revenue model, especially those that rely on the Free To Paid model. Twitter is the fastest growing social network, positioning itself to quickly be the largest social network – far larger than Facebook, Myspace, Orkut, etc. Twitter can attribute part of this massive growth to their open API, which allows developers to integrate Twitter functionality into their web services. But who exactly is “tweeting” ? It turns out that 75% of all tweets come from 5% of twitter users. And 32% of these users are bots – systems which use Twitter’s API to send automated tweets based upon certain activities. On a side note, we’ve successfully integrated Twitter into several web services, delivering pre-configured updates based upon activities such as adding events to a website, or approving the release of new content. We’re quickly finding Twitter to be a powerful tool for local search engine optimization. Search engine optimization – the fuzzy art of ranking your website at the top of search engine queries – is the one of the most important elements of online marketing. I’ve often said that there are three levels of SEO practitioners; those that are novices, those that know enough to be dangerous, and experts. SEOMOZ has brought together experts in the field of Search Engine Optimization for their thoughts on what works, and what doesn’t with regards to Local Search. Local Search is fairly self explanatory – it is the ranking of your site for localized search engine queries. For quite some time I have found Local Search a powerful way to drive traffic to your site, in part due to the “Long Tail” effect where longer, more specific searches drive more relevant, targeted traffic to your website.